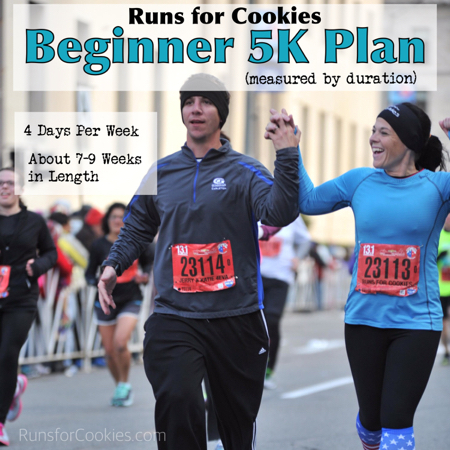 Runs for Cookies: Run Your First 5K: 8 Beginner Training Plans! As I've mentioned several times, when I first started running in 2010, I literally could not run even 500 feet. A mile sounded completely impossible. And a 5K? How on earth did people do that?! 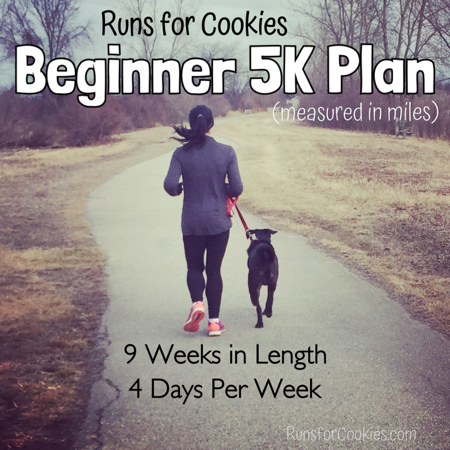 I tried the Couch to 5K plan a few times, and I just couldn't get past week 3. 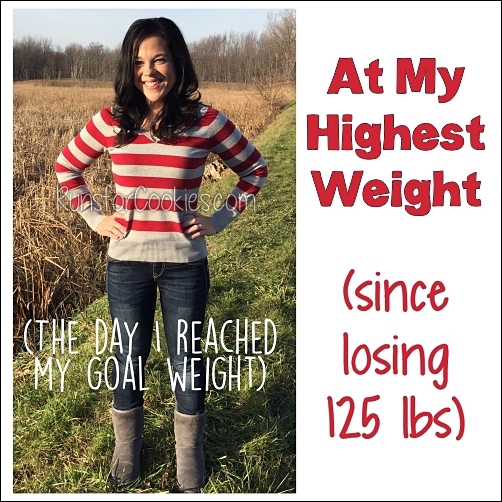 Week 4 was too big of a jump in distance for me. Also, I despised running intervals. 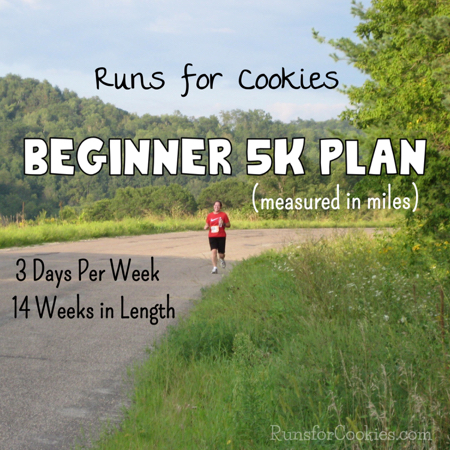 The Couch to 5K plan has you run for a period, then walk, then run, then walk, over and over again. I found myself dreading hearing that beep on my watch, signaling me to start running. So, I started doing my own thing. I ran as far as I could manage, and then I walked until I'd reached 30 minutes total. The next time, I ran a little farther than the first, and then walked the rest of the workout. 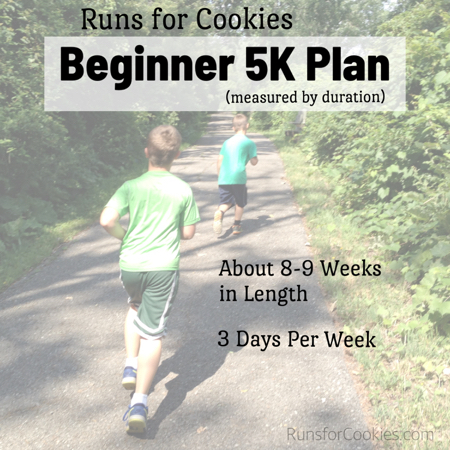 I only had one running segment, and I simply increased it each time I ran (three times per week). After the running segment, I would walk until the workout totaled 30 minutes. So, the running portion was increasing and the walking portion was decreasing, little by little. And eventually, I ran the entire 30 minutes. 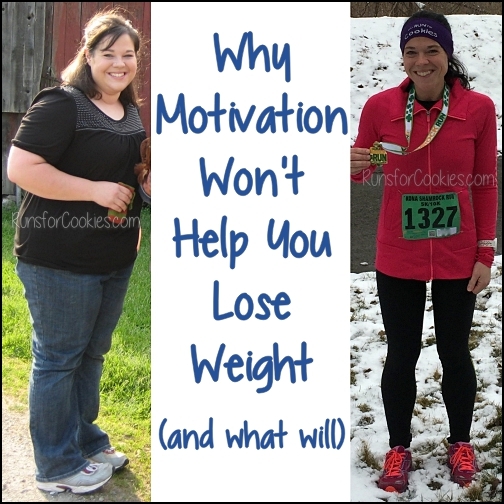 I wrote out a plan for all of this, to be able to go from "couch potato" to running for 30 minutes. 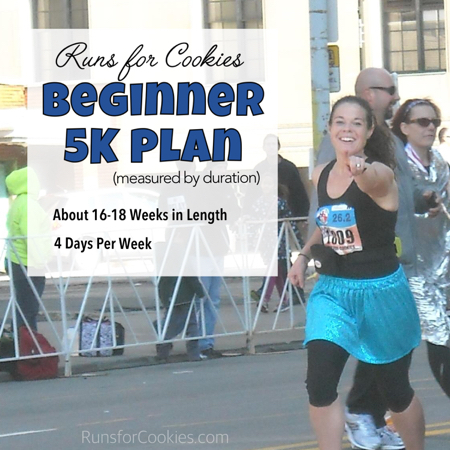 But I didn't have a specific 5K plan for beginners, and several people have requested that I write one. Some of the plans are short, and some are long. Some increase time/distance more quickly than others. 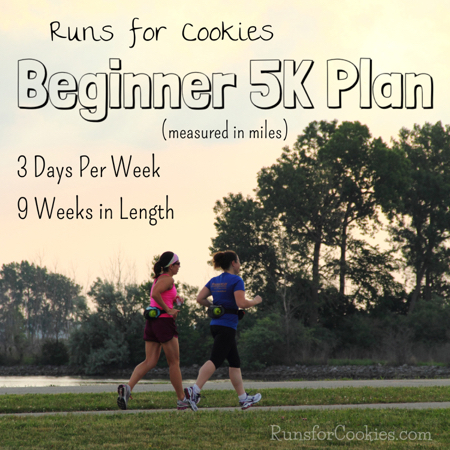 There are eight different plans for one common goal: to go from non-runner to runner. 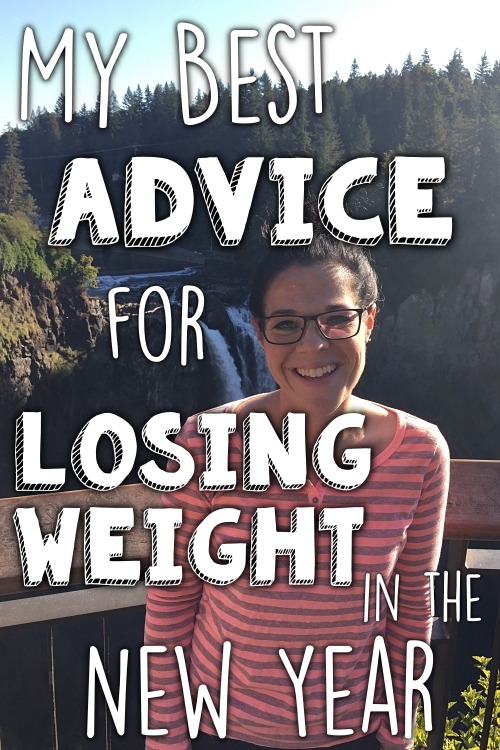 1) I know it's redundant, but make sure your doctor okays the plan. 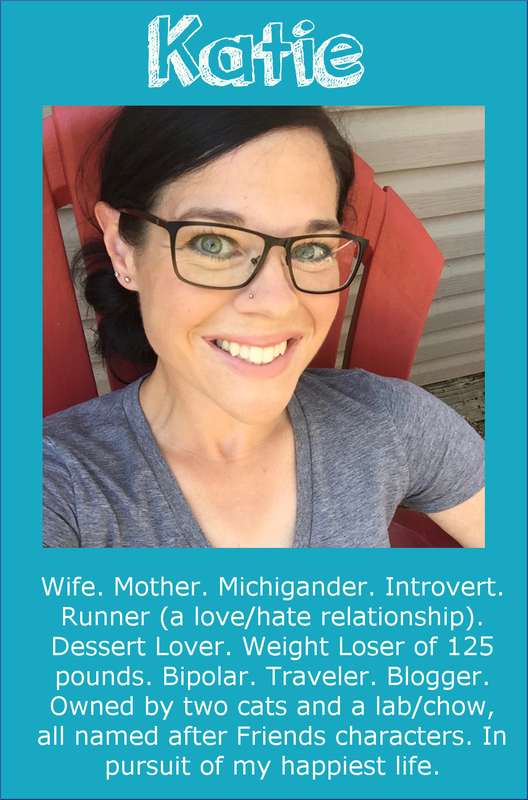 2) Running is going to be hard. 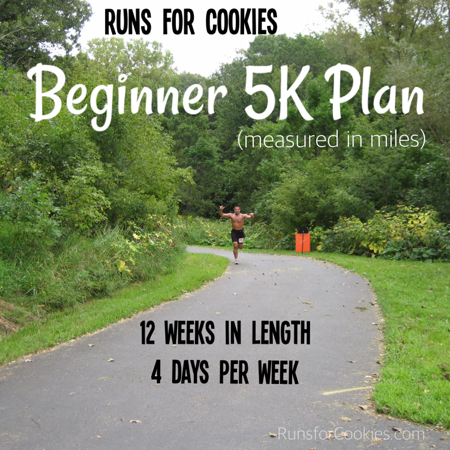 If it was easy, there wouldn't be training plans to go from non-runner to runner. Expect it to be difficult, but I promise you that it will get easier. 3) Run as slowly as possible. You may feel like you can walk faster than your running pace, but building up distance is the top priority. 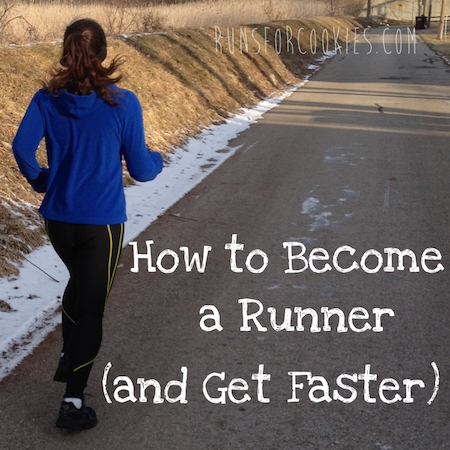 You will naturally get faster as you build up your distance, and you can always work on your speed later. At this point, running slowly will allow you to complete the workout. 4) When choosing the plans that are measured by time spent running, rather than distance, the number of weeks in the plan will vary by individual. Some people will get in more distance during the time spent running than others, so they may finish the plan earlier. First, these are the plans that are measured by mileage. 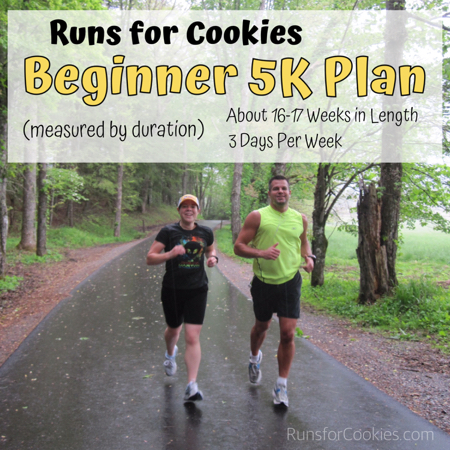 The first few weeks of each measures the running portion in duration (time), because it is such a short distance; but then it switches over to distance. Next, these are the plans that are written in duration, so it schedules minutes instead of miles. It's just a matter of personal preference. How have I never seen that picture of you and Jerry running a race and holding hands before--I love it!!! Great plans! I also had difficulty with CT5K. 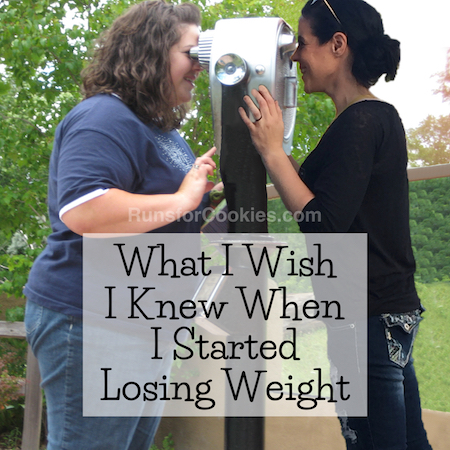 It started off slow, but it (tries) to have you running for 20 min within just a couple weeks. Show me a true beginner that can do that. Can't wait to try one of your plans. Thanks for this!! I started one of the plans today. I am a slow runner and need more time to build up than most plans give. Yours look much more doable!! Thanks again! Thank you for sharing these! Can't wait to start one of these! Thanks for sharing so many different plans. 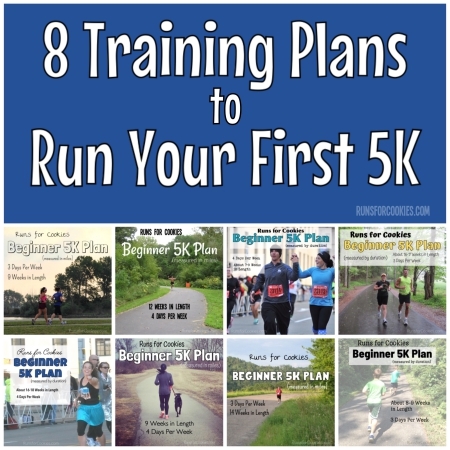 Every year, I have a goal to run a 5k and most plans just build up too quickly. I'm a 51 year old walker and I have a tendency to get injured, so I'm going to try Plan 6 and take it as slowly as I need to. My fastest 5k doing walk/run intervals was 38 minutes. I'd love to get down to 35, but I'd also just love to be able to run the entire thing for once! Hi Katie, plans 6-8 won't show up for me...just me or is it the links? Hmmm... they are working okay for me, and I haven't had anyone else mention that they aren't working. Have you tried again recently? Thanks for letting me know! I have no idea why it stopped working; I just uploaded it as a different file name, and it should be working now!